Port Moresby (The National): PAPUA New Guinea and Australia will stand together to solve issues affecting both countries, including the Manus detention centre. Prime Minister Peter O’Neill said this during an interview with Australian journalist Mark Baker of The Age newspaper at the Airways Hotel in Port Moresby yesterday. 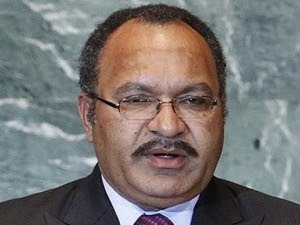 “Australia is our closest neighbour and has stood by PNG during our good and bad times to address many of our developmental challenges,” O’Neill said. “PNG’s stand to bring in boat people to the Manus detention centre is not necessarily to promote our placing in the world but to work with Australia to address the asylum seekers problem. “We have been working together and we have to work together to address such issues affecting our region. He said PNG and Australia were seriously considering concerns and issues raised by the United Nations High Commission for Refugees and were working towards addressing those issues. “An early indication from the boat people is that they want to return home and this is a good reaction,” O’Neill said. “New Zealand is also interested in participating as it is an issue where we all will come together to address. “The development benefits to us from Australia are immense and, as a leading Pacific nation, we are partnering with Australia to address a regional issue.